POLICE IN NORTHERN Ireland are again appealing for witnesses to come forward following the deaths of three teenagers at a St Patrick’s Day disco in Cookstown, Tyrone. 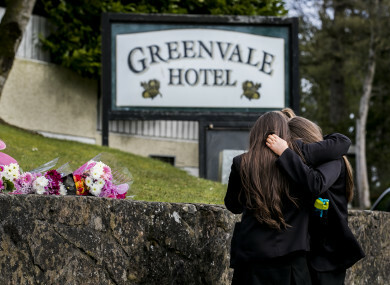 17-year-old Lauren Bullock, 16-year-old Connor Currie and 17-year old Morgan Barnard were killed in the incident outside the Greenvale Hotel. Their funerals are due to take place tomorrow. Morgan Barnard’s funeral mass will be held in Saint Patrick’s Church, Dungannon, at 10am while Lauren Bullock will be laid to rest at 11am in Saint Patrick’s Church, Donaghmore. At 2pm, Conor Currie’s funeral mass will take place in Saint Malachy’s Church Edendork. “With the funerals of Morgan, Connor and Lauren tomorrow, my thoughts and the thoughts of all my officers are very much with the families. Our job is to get them answers as to why they have lost their children,” PSNI Detective Chief Superintendent Raymond Murray said. On Tuesday, detectives from the PSNI Major Investigation Team arrested two men aged 52 and 40 on suspicion of manslaughter. They were taken into custody for questioning. To date, detectives involved in the investigation have identified 400 young people who were in the queue or car park on Sunday evening. 82 of those young people have now been interviewed and arrangements have been made to interview 106 others over the next few days. 72 people have availed of the facility at the Burnavon Centre to speak with detectives. Detectives are appealing to anyone who has not yet contacted them to come forward. “In the joint statement from the three families, they have made clear they wish that witnesses come forward and talk to police,” Murray said. Detectives would again reassure anyone with concerns, they focus of our investigation is not the age of people who were at the event – it is about trying to find answers for the families of the three teenagers who tragically died. “I would urge parents to talk with your children, support them and encourage them to come forward and tell their story to police so we can get an accurate picture of events that night. Their accounts of events on Sunday night could be crucial to establishing how Connor, Lauren and Morgan died,” Murray said. Detectives can be contacted at the dedicated incident room at Dungannon police station by calling 101, extension 53055. Alternatively, people can visit the dedicated room at the Burnavon Arts Centre in Cookstown. Email “'Our job is to get them answers': Police urge witnesses of Tyrone disco crush to come forward”. Feedback on “'Our job is to get them answers': Police urge witnesses of Tyrone disco crush to come forward”.